I have never done this before but I would like to share with the community my transplant story and what motivated me to share it. This morning I spent a little time at the John Hunter Hospital having intravenous iron, hoping it will give me some much needed energy to enjoy myself a little more. I have never fully explained to anyone about my health or how I really feel until now. I am about to do so for a reason, which is to ask my family, friends and people in the community to make a donation to the Hunter Transplant Research Foundation to help them continue their vital work into the immune system after transplantation. Hopefully, they will find a way to reduce the amount of drugs we take to keep our kidney working and to lessen the impact these drugs have on the rest of our body and organs over time. I had my transplant on 31st August 2009. This gift was given to me from my amazing sister-in-law. The operation was a success but soon after things took a down turn and many stays in the transplant ward would follow. As a result of the drugs I had to take post-transplant, I became an insulin dependent diabetic and encountered heart and lung problems, shortness of breath, severe osteoporosis with very little bone turn over. That means, you never want to take a fall because your bones won’t heal. Now, I use a walker or walking stick and have rails both inside and outside my home as fall prevention aids. It took a long time for me to get my head around and at times the tiredness is debilitating. My kidney function is low but holding its own. The great news is while I have a new fistula ready to go back on dialysis, I am not on it yet, so I am still free to do what I want, when I want, when I feel like it. Prior to my transplant, I had a metastatic malignant carcinoid tumour removed. The hoops I had to jump through to convince the transplant team that I was more than willing to take the chance of moving forward while knowing full well that the carcinoid could return, and the risk of developing other cancers was high. I knew what the risks were going to be. I was well informed and prepared to accept them. If I was to develop a cancer it would most likely be due to the immunosuppressant drugs. Here I am six years post-transplant showing no evidence of a carcinoid recurrence. I am diligent in having regular checks ups with my gastroenterologist, it’s for my own well being. I’m happy I made this decision and the team supported me in the end. There is more that I could add but I think I’ve shared enough, except to say, please make a donation. No matter how small, every bit will help to keep the research team moving forward to find an alternative to these drugs. It will be so beneficial for transplant recipients into the future to not have to go through what I do every day. Even though I have these chronic problems I don’t regret one day, because if I was still on dialysis I more than likely would not be here. I am so grateful to my transplant team, nephrologists, other specialists and Hunter Primary Care, Maitland for their medical care and support which keeps me going. Thank you so very much. 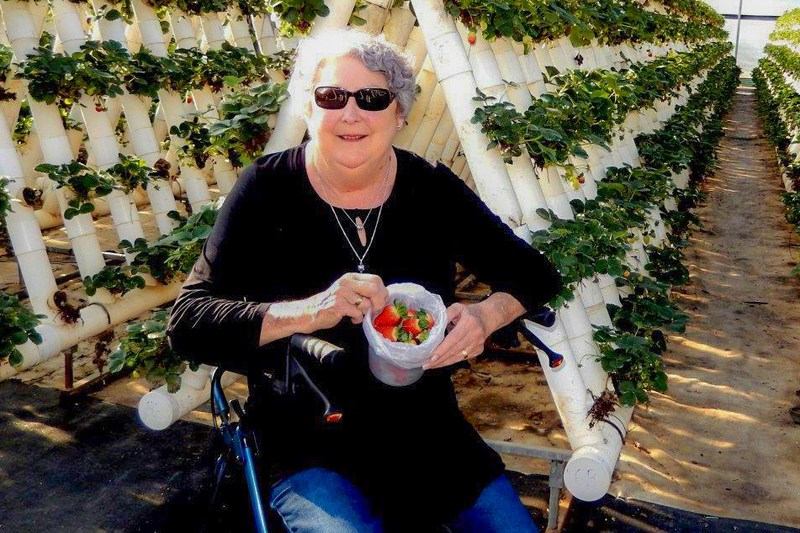 Carol Linsley, making the most of her second chance at life, pictured here, at a strawberry patch with her walker. Please go to www.htrf.net.au and read about the great work the research team are doing. To make a donation click here. This post is a follow on from My Transplant Story that was posted in September. I would like to add an excerpt, at the time of my first post, friends of mine were going through one of the hardest times of their lives and still are and will be forever, so I omitted to write other feelings I had at that time. With permission I am able to disclose what that was. You no doubt would have read about Milly Soderstrom who passed away in a tragic accident recently, aged eight years. Milly was a joy and delight to her immediate and extended family and bought so much joy to everyone she met. Jane her mother made the biggest decision she will ever have to make, that was to let five other children have the chance to live relatively normal lives by having a transplant. I was so in awe of Jane having to make that descion at such a devastating time, I still am today. There is not a day that has passed since that I don’t think about the family and how they are doing, which I know is not well. My reason for this post is to highlight the importance of talking to your family about organ donation, a lot of people are frightened to discuss it because of the unknown, do some research, most people know how to Google, information is only the click of a button away, talk to your doctor or people who have gone through this experience. Once you have made the decision make sure your family fully understand that this is what you want. Do it while you can as it will be so much harder at the hospital which is full of medical staff and you’re already grieving for your loved one. Like I said previously, while I struggle every day post transplant I have no regrets what so ever, I am forever appreciative and grateful for the kidney I have that keeps me off dialysis another day. Also another reminder to make a donation to the Hunter Transplant Research Foundation for the wonderful work they do in trying to limit the amount of drugs we need to take so we don’t go into rejection. Enjoy each day as it comes while you can as you never know what’s coming next. Do you have a story that you would like to share with the transplant community?